Bent's Old Fort National Historic Site. A reconstruction of the original fort, this is probably the best place in the country to learn about the Santa Fe Trail and the opening of the West. Garbed in 1830s frontier costume, the blacksmith stands before a work bench madeof rough hewn cottonwood. His cupped hands hold a bunch of dry grass. In the grass is an ember, a small piece of	charcloth into which he has just struck a flint spark. He blows gently into the grass, gradually setting it on fire. When flame finally erupts, he lays the grass on a stone hearth and covers it with pecan size chunks of coke. Then he creates a miniature volcano by pumping air into the forge with a six-foot leather bellows connected to a tube made of buffalo hide. He heats a steel rod to cherry red and shapes a hook using only his hammer and anvil. "A Bic lighter would be faster," I offer, garnering some chuckles from the mesmerized group watching the ancient process. "I don't know him," replies the blacksmith, gently reminding me that in the smithy the time is the 1830s and not 160 years later." The smithy is the heart of the Bent's Old Fort National Historic Site, a reconstructed adobe trading fort on the banks of the Arkansas River six miles east of the Colorado prairie town of La Junta. Like a time machine, it transports visitors to the 1830s, to Santa Fe Trail days, to a world of mountain men and pioneers and the vast empire of Bent, St. Vrain & Company. "It was like putting in a gas station at a vacant intersection." 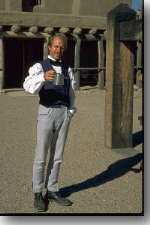 A living history interpreter portrays William Bent, the fort's founder. trading empire that extended into nine present-day states. As the power hub of a vast area, the Company played a pivotal role in the westward movement, and even managed something that was apparently beyond the ken of the U. S. government -- it negotiated fair treaties between the Indians and whites that assured peace in the area for years. Matthew C. Field, a visitor in 1840, described the Fort as "... constructedwith all the defensive capacities of a complete fortification.... The dwellings, the kitchens, the arrangements for comfort are all such as to strike the wanderer with the liveliest surprise, as though an 'air-built castle' had dropped to earth before him in the midst of the vast desert." The park was designed to give visitors the same feeling that Field had. The reconstructed fort sits about a quarter mile from the entrance station at the Bent's Old Fort National Historic Site, and the path from the entrance station follows the original Santa Fe Trail. You can tour the Fort, view a video of its history, and watch living history interpreters dressed in period costume perform the tasks typical of the era in two to three hours. Bent's Old Fort National Historic Site is on Colorado Highway 194, 6 miles east of La Junta and 13 miles west of Las Animas, both cities on US Highway 50. La Junta is about 80miles east of Pueblo, Colorado and about 140 miles west of Garden City, Kansas, on US 50. The easiest way to find the Fort is from La Junta, where you are guided by signs from US 50. Admission is $2 per person, under 17 free. Special events are scheduled several times through the year. Write the superintendent at 35110 Highway 194 East, La Junta CO 81050-9523 or call (719) 384-2596. Other attractions in the area include the Koshare Indian Kiva, 18th St and Santa Fe Ave, La Junta. A museum of Indian artifacts and art, with a Kiva based on southwestern Indian kivas. The Koshare Indian Dancers, a nationally recognized group of Explorer Scouts whose objective is to help preserve Indian culture, perform Indian dances in the Kiva on Saturday nights in the summer. Admission to the museum is $2, $1 seniors and under 17. Dance performances are $4, $2 under 17. Phone (719) 384-4411.